In the words of House Claus of the North Pole: Holidays are Coming. While you’re no doubt busy with shopping, baking, and decorating (not to mention getting through all of those last minute end-of-the-year projects at work), don’t neglect another important office task – crafting your out of office message. Oh sure, you could play it safe and write the usual “I’ll be out of the office until X. If you need immediate assistance please contact Y.” But, can you say boring? I can. And just did. So why not make that magical email auto responder work for you, while you’re busy not working? You know that “Y” person in the boring example above? The rest of your out of office message is a great opportunity to tell your senders exactly *why* that person can handle whatever comes their way while you’re gone. 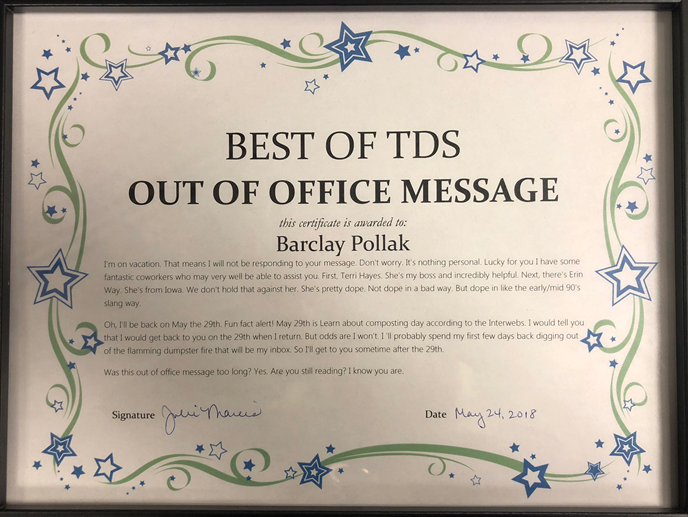 No one loves being someone’s backup, but a few kind words both reassure your audience that they’re in good hands, and show your colleague you recognize their effort on your behalf. The New York Times’ Erin Grau’s out of office message was so good it was retweeted over 700 times! While you could certainly use your autoresponder to talk about one of your company’s products or services (we’ll get into that next), you could also use it to share some favorite bits of knowledge, a great historical tale, or even a recipe (tie it in to wherever you’re headed to achieve the ultimate out of office synergy). You can absolutely use your out of office message to promote your company, but you can also use it to promote yourself. Speaking at a conference? Share a link to your presentation in your auto responder. Doing some training? Let your colleagues know ahead of time about your new expertise. I’m on vacation. That means I will not be responding to your message. Don’t worry. It’s nothing personal. Lucky for you I have some fantastic coworkers who may very well be able to assist you. First, Terri Hayes. She’s my boss and incredibly helpful. Next, there’s Erin Way. She’s from Iowa. We don’t hold that against her. She’s pretty dope. Not dope in a bad way. But dope in like the early/mid 90’s slang way. Oh, I’ll be back on May the 29th. Fun fact alert! May 29th is Learn about composting day according to the Interwebs. I would tell you that I would get back to you on the 29th when I return. But odds are I won’t. I’ll probably spend my first few days back digging out of the flaming dumpster fire that will be my inbox. So I’ll get to you sometime after the 29th. Was this out of office message too long? Yes. Are you still reading? I know you are. 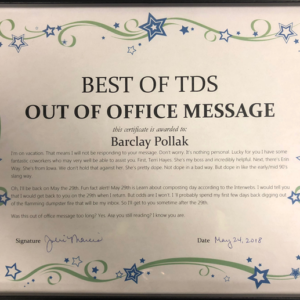 Have you seen any great out of office messages? Share them in the comments!